In 1946 our ambassador to the USSR was Averell Harriman. The Russians pulled a fast one on him. 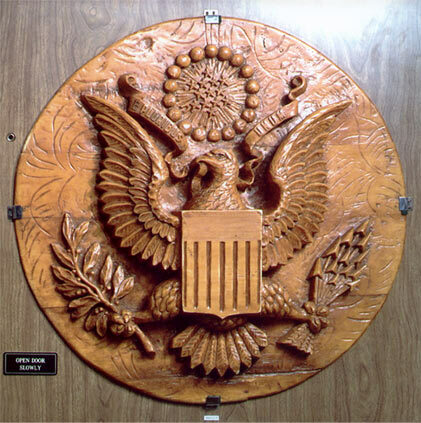 They had Soviet school children present the ambassador with a two foot hand craved great seal of the US which Ambassador Harriman hung in his office. In 1952, a countermeasures survey revealed that the great seal contained a bugging devise. That means that for six years, the Soviet Union had the ambassador's office bugged. 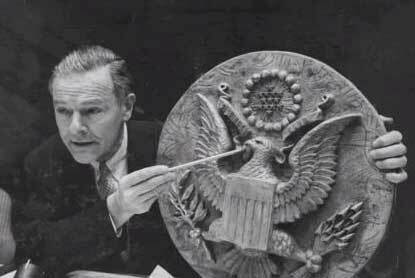 On May 20th 1960, Ambassador Henry Cabot Lodge, Jr. revealed the great seal bug to the UN. The actual bug was very ingenious. Any sound made in the room caused a spring to vibrate. Eavesdroppers outside the building could then pick up the vibration measurements from the spring and turn it back into sound. The microphone hidden inside was passive and only activated when the Soviets wanted it to be. They shot radio waves from a van parked outside into the ambassador's office and could then detect the changes of the microphone’s diaphragm inside the resonant cavity. When Soviets turned off the radio waves it was virtually impossible to detect the hidden ‘bug.’ The Soviets were able to eavesdrop on the U.S. ambassador's conversations for six years. Copyright: 2008, 2011, Thomas Investigative Publications, Inc. All rights reserved.